To evaluate the effect of a specified treatment course with CES on the anxiety and depression levels in general anxiety disorder (GAD) patients. An IRB approved 6 week open label study. 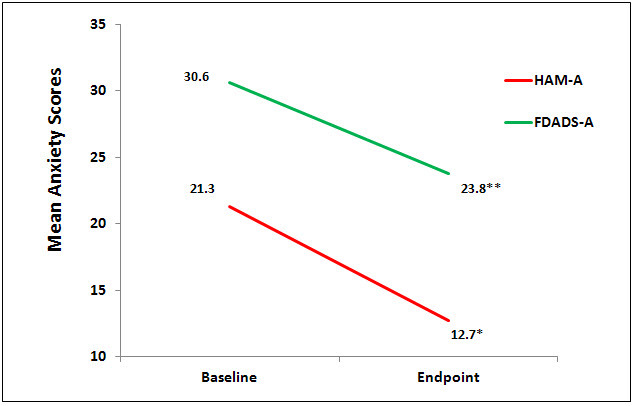 Baseline measurements were done just prior to the first CES treatment and outcome variables measurements were done at endpoint of study right after the final CES treatment. The primary outcomes endpoint was the change from baseline to endpoint of the 6 week study on the Hamilton Anxiety Scale (HAM-A) and Clinical Global Impression-Improvement Scale (CGI-I). The secondary outcomes endpoint was the change from baseline to endpoint of the 6 week study on the Four-Dimensional Anxiety and Depression Scale – Anxiety subscale (FDADS-A), and Hamilton Depression Scale17 (HAM-D17). • Male or female outpatients age 18-64 years who had a current diagnosis of GAD. • Mini-International Neuropsychiatric Interview (MINI) was conducted at screening to confirm GAD diagnosis. • Must have a score of > 16 on the HAM-A and a score 20) so as to include milder and more numerous cases of GAD in order to improve the generalizability of these results to clinical practice. • Has a primary diagnosis meeting DSM-IV criteria for any Axis I disorder other than GAD. • Met DSM-IV criteria for mental retardation or any pervasive developmental disorder or had a neurologic impairment. • Has a current diagnosis or recent (6-month) history of drug or alcohol dependence or abuse. • Has current suicidal ideation and/or history of suicide attempt. • Has any personality disorder of sufficient severity to interfere with participation in the study. • Has presence or history of a medical disease that might put the patient at risk or compromise the study. • Pregnant or breastfeeding women and those of childbearing potential who were not practicing a reliable form of contraception. Baseline measures were done, prior to start of treatment period, and outcomes measures were done at end point of study, 6 weeks. No change was made in the medical management of the patients during the study. After instruction on how to use the CES device, participants subsequently self-administered CES at home for 60 consecutive minutes each day between the hours of 3:00 PM and 7:00 PM for a total of 6 weeks. Subjects recorded each treatment session in daily treatment logs, which were reviewed at 3 weeks and 6 weeks study visits. All subjects chose 300 µA as their preferred level of current. Those treated with benzodiazepines (alprazolam and lorazepam) took them on an as-needed basis no more than twice per week. Response to treatment was defined as a reduction of 50% or more on the HAM-A and a CGI-I score of 1 or 2 (very much improved or much improved, respectively). The Hamilton Anxiety Rating Scale was used to measure the severity of anxiety symptoms and to identify the response to CES. It has established reliability and validity in the literature (Maier et al., 1988). The Hamilton Depression Rating Scale17 (HAM-D17) was used to measure the severity of depression symptoms and identify the response to CES. It is has established reliability and validity in the literature (Cusin et al., 2009). The Clinical Global Impressions Improvement Scale (CGI-I) was used to measure subjects’ response to CES treatment (Guy, 2000). The Four-Dimensional Anxiety and Depression scale was used to measure anxiety (Bystritsky et al., 1996). All scales have established reliability and validity. Fifteen (15) subjects expressed interest in the study and engaged in an initial telephone screen. 20% of participants (N = 3) were deemed ineligible to participate because of age (N = 1) and psychiatric comorbidity (N =2). 12 subjects enrolled and received CES treatment. The mean and SD age of the sample was 42.83 ± 10.27 years. Of the 12 individuals enrolled in the study, 9 females and 3 males, 5 participants had been taking psychotropic medications (venlafaxine, N =2; prazolam, N = 2; lorazepam, N = l) for at least 3 months prior to enrollment and continued throughout the study. Two of these had failed 2 previous adequate trials of SSRIs. There were no statistically significant differences at baseline on any of the outcome measures. Nine (9) subjects completed the testing at the endpoint of the study, week 6. 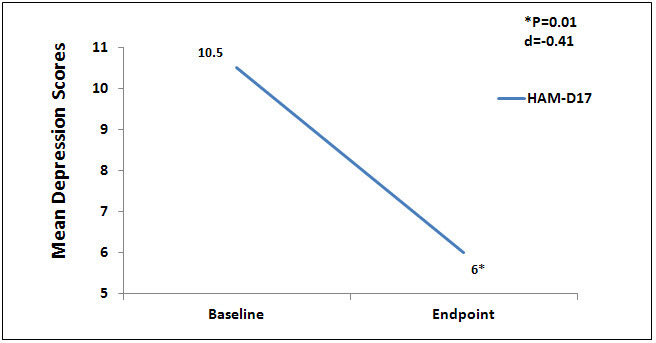 Data were analyzed using a 1 sample paired t test to compare baseline to endpoint means on outcome variables with a significance levels set at p = .05, 2-tailed. At the end point of the study, subjects had significantly lower scores from baseline to endpoint of study on the anxiety outcome measures, HAM-A (p = 0.01, d = -1.52) and FDADS-A (p = 0.39, d = -.75), and on the outcome depression measure, HAM-D17 (p = 0.01, d = -.41). See Figures 1 and 2 respectively. Figure 2. Mean depression scores on Ham-D17. Three subjects withdrew from the study after baseline measures because of the side-effects of headache (N-2) or dizziness (N=1). These side-effects are suggestive of a central nervous system effect by CES. This study was done in preparation for a large randomized control trial on the effect of CES on generalized anxiety disorder. The quality of the research of this small open label pilot study is excellent. Pre-specified criteria for success were set for outcome measures at endpoint of study. The Mini-International Neuropsychiatric Interview was conducted at screening to confirm GAD diagnosis using DSM-IV criteria. Patients were eligible for the study if they met a cut-off score of > 16 on the HAM-A and a score < I7 on HAM-D17. All subjects followed the same specific CES treatment protocol related to duration and frequency of treatments, time during the day of treatments and use of an Alpha-Stim CES device with a setting at 300 µA. This study has the limitations of an open label small pilot study, such as the small number of subjects. The authors also state because the small N of the study, the placebo effect associated with GAD could be a confounding variable. The value of this study is that it forms a basis for a large randomized controlled trial on the effect of CES on GAD. This study is also valuable because the findings are consistent with the findings of RCT studies that showed CES significantly decreases anxiety. Note: Effect sizes were calculated by Larry Price, PhD, a statistical consultant to Electromedical Products International, Inc. using the means and standard deviations from Table 1 in the Bystritsky et al. published article. AB, Professor of Psychiatry and Biobehavioral Sciences, Director University of California at Los Angeles Anxiety Disorders Program Semel institute for Neuroscience and Human Behavior, Los Angeles, CA. Bystritsky A, Waikar SV, Vapnik T. Four-dimensional Anxiety and Depression Scale: a preliminary psychometric report. Anxiety. 1996;2(1):47-50. Guy W: Clinical Global Impressions (CGI) Scale. Modified From: Rush J, et al. : Psychiatric Measures, American Psychiatric Association, Washington DC, 2000.